Heather McCready, with Milo Deering! “Refreshing” is a descriptive term that comes to mind as I attempt to describe a night filled with the vocal expressiveness of Heather McCready. I believe this term has been used before, but it truly is fitting. The full house was entertained from start to finish, with everything from Amazing Grace–blues style–by Love & Grace [opening act], to Milo Deering doing Johnny Cash’s Folsom Prison Blues while waiting for the train to pass! Very well-crafted songs filled the night, and we even included a speaker on Market Street, spreadin’ the love in between the buildings downtown! Heather was simply wonderful, performing her sweet originals like the whimsical “Give It A Day” by her & Milo, great covers like “Smile,” and injecting her personal story that revolves around her Bi-Polar disorder–a very complex brain disease, but one that can be managed by today’s mental health professionals. Heather McCready is living proof! 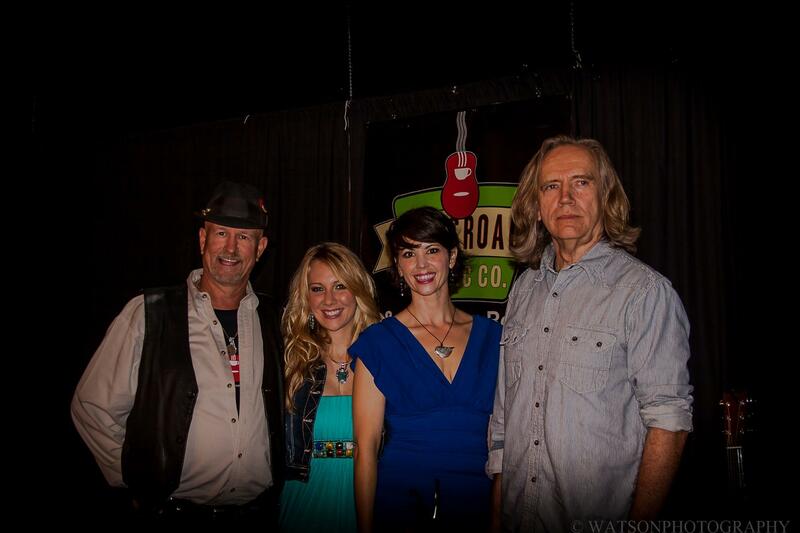 Pictured [l to r]: Gus Gustafson, Lindsey Gail, Heather McCready, & Milo Deering. Photo compliments of Watson Photography.